When the Trump administration proposed cutting the Environmental Protection Agency’s funding by a staggering 31 percent, Scott Pruitt told Congress that was fine. “I believe we can fulfill the mission of our agency with a trim budget,” the agency administrator said at the time. Congress ultimately rejected those cuts in its omnibus spending bill, but Pruitt continues to run the agency with a flair for austerity—except, reportedly, when it comes to his preferred staff. 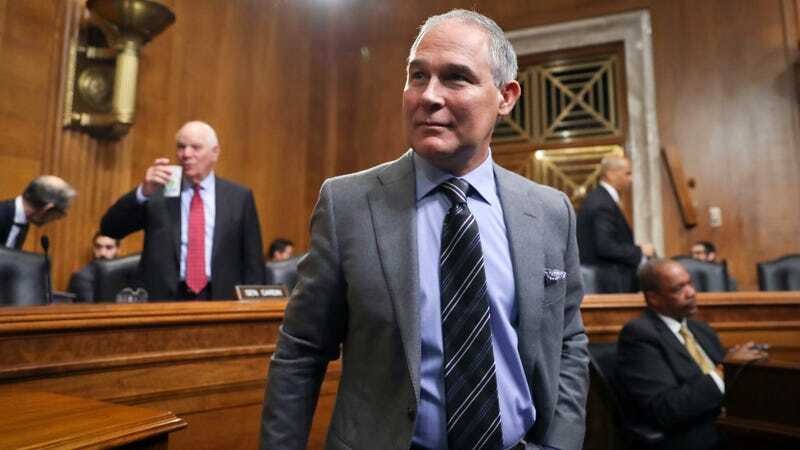 According to a report from The Atlantic, Pruitt went around the White House to give two of his favorite aides—both came with him from Oklahoma, where he served as attorney general—significant raises. Pruitt had originally asked that one of his top aides, now the agency’s senior counsel, have her pay bumped from $107,435 to $164,200; he also requested that the other aide, now the agency’s scheduling director, have her pay increased from $86,460 to $114,590. The White House rejected both proposals. And so Pruitt got the raises, continuing his pattern of spending public money in the most self-serving of possible ways, always. “This whole thing has completely gutted any morale I had left to put up with this place,” one EPA official told The Atlantic. Considering that Pruitt is using his post to slowly dismantle the agency and cook the earth, that’s saying a lot.